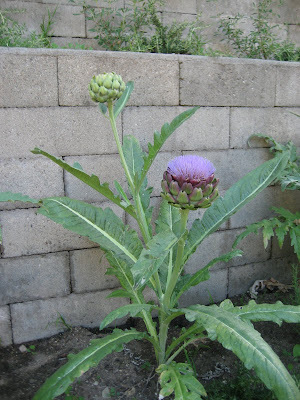 So I first posted about the artichokes we planted in our yard on April 19. And exactly 2 months later they had doubled in size and I posted again showing the progress of one little artichoke that could and the bud that it had created. 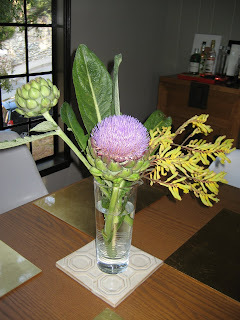 This week the artichoke finally bloomed and created a beautiful purple pom pom. Which I then added to the kangaroo paw arrangement from earlier this week. By the way, both arrangements used various vessels found in the ktichen - no need to buy a vase when a pitcher or salad dressing container works just as well. This is one of my great ambitions in life!!!! We bought a seedling before we went away but the bugs seem to have had several meals of it, so I'm babying it now a bit. Yours looks great! Can't believe it got so big in two months. Thanks for the headsup on Mendocino Farms. It's always good to know places downtown. It's NOT like NY, you do have to cover a wide area to find much in my experience so far! 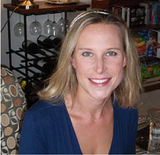 Which was fairly shocking to me. More importantly, did you eat them?? ?